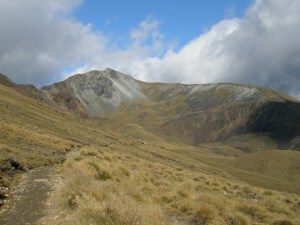 The second day doing Kepler Track, and this was the day I was most looking forward to – the alpine ridge section between Mount Luxmore and Iris Burn Huts. Luckily it was a very nice day, as the track can be hell in high winds and rain (people having to crawl along ridgelines with sheer drops either side). 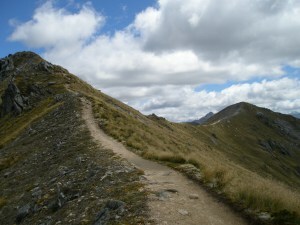 But first, it was more uphill, as I wound along the hillside getting closer to the top of Mount Luxmore. More hills – you can imagine how pleased I was. Still, at least it was in the open so I could see where I was going, unlike yesterday’s forest hike. 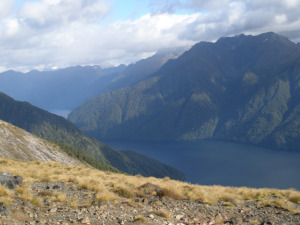 The track lay clear ahead, and the views down towards one of the arms of Te Anau lake were stunning. Eventually I reached the point where you get to turn off the track and take a quick side trip up to Mount Luxmore’s top. 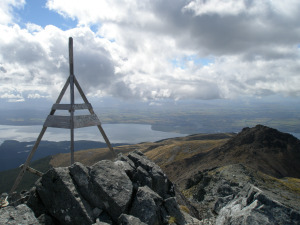 I scrambled to the top, and was quite impressed with myself – I’m really not very good with heights, and there was a strong wind near the summit that didn’t help matters. I stayed long enough to take a photo and then got down as quickly as I could. From here, it was mostly sidling along hillsides for a couple of hours, trying to walk daintily in clumping great boots through an avalanche zone. There were a couple of avalanche shelters along the way, where I stopped to have some chocolate and laugh at the keas (trying desperately to steal another tramper’s socks). 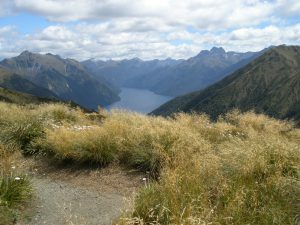 Once I hit the ridgeline, it was a fairly easy walk, with fantastic views, until I hit the zig-zag from hell – a steep, endless, rocky downhill track that turned my knees and ankles to jelly. I was very, very glad to get my sunburnt self to Iris Burn Hut. Though it could have been worse. Robbie, the Hut Ranger, had some stories to tell about the alpine section that were a little hair-raising. Not too long ago he’d been helping a school group over it in absolutely awful weather – one poor girl was so terrified she was huddled in a foetal position on the track and refusing to move. At least those of us sharing the hut had had good weather – Robbie had heard from Jeff over the radio, and the people walking a day behind us were not so lucky – it was so wet and windy at Luxmore that the entire hut was shaking. I’m so very glad I missed that.